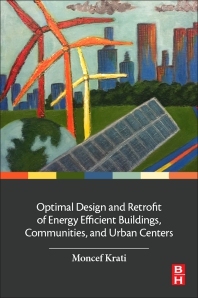 Optimal Design and Retrofit of Energy Efficient Buildings, Communities, and Urban Centers presents current techniques and technologies for energy efficiency in buildings. Cases introduce and demonstrate applications in both the design of new buildings and retrofit of existing structures. The book begins with an introduction that includes energy consumption statistics, building energy efficiency codes, and standards and labels from around the world. It then highlights the need for integrated and comprehensive energy analysis approaches. Subsequent sections present an overview of advanced energy efficiency technologies for buildings, including dynamic insulation materials, phase change materials, LED lighting and daylight controls, Life Cycle Analysis, and more. This book provides researchers and professionals with a coherent set of tools and techniques for enhancing energy efficiency in new and existing buildings. The case studies presented help practitioners implement the techniques and technologies in their own projects. • Need for Integrated and Comprehensive Energy Efficiency Analysis Approaches: Optimization, Life Cycle Cost Analysis, Energy Productivity, and Integration with Renewable Energy Systems. • Integrated HVAC Systems including Passive Heating and Cooling Systems and Geothermal Systems. • Applications to Retrofit Existing Buildings.